Some Donald Duck Friday fun! 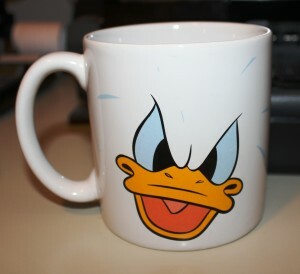 My Donald Duck temper tantrum coffee mug! I love my coffee mug so much that I felt the need to share a photo of it on Facebook earlier today — and I thought I’d share it here, too! It’s a huge Donald Duck mug that I bought at the Disney Store here in Moncton years ago before it closed. It was a great store — especially for someone like me who’s been a great fan of Donald Duck for years! I always thought his temper tantrums were hilarious. Imagine my pleasant surprise when I found an extra-large coffee mug (the best kind!) with a graphic of Donald having a tantrum! One of my favourite Donald “temper tantrum” cartoons is Donald’s Tire Trouble from 1943. Enjoy!